Ucluelet Aquarium: You can't see this in the Wild! On a surprisingly sunny Tuesday in late May, a red turban snail glides up the glass of its tank, extending a drill-like tongue to rasp off the algae that has begun to settle there. 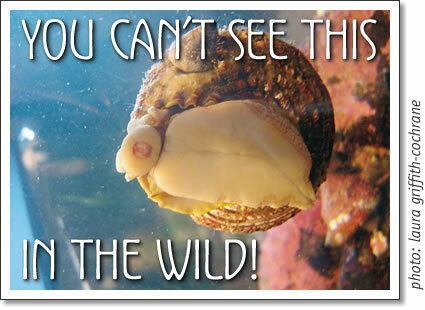 Just below the round protuberance that holds the mouth, the foot of this mollusk can be seen pressed against the glass, displaying the powerful suction required to move along the perfectly smooth surface of the aquarium. This sight is among a class of viewable activities and features invisible in the natural setting. An aquarium permits not only these individual observations, but the possibility for longer interactions as well. Much of our understanding of many invertebrate life histories would be lacking were it not for our ability to observe the growth and activity of these organisms over extended periods of time and without having to be immersed in water. For example, there are plumose anemones attached to the glass of the rockfish tank. The long stalk of this plankton-eating anemone remains on the glass using powerful compounds and suction. They can grow very tall (the largest anemones in the world in fact, at over 3 feet in height), and must be strong to support their body mass while they reach out for food passing by. The base of the stalk of the anemone, where it attaches to rocks or other objects, is called the pedal foot; a specialized structure to anchor these organisms to the substrate. Green surf anemones live in a violent wave-pounded home, and this pedal foot anchors them to the nutrient-rich intertidal zone; a diverse dining hall, if you have the right equipment to feast there. Another incredible sight: bat stars engulfing algae. Since the water in the aquarium arrives in each tank unfiltered, organisms are constantly infiltrating the building and attaching themselves to the glass. In the case of the bat stars, the settling algae is a tasty treat, and these sea stars extend their first of two stomachs outside of their body, to surround their snack and digest it through the thin delicate folds of digestive tissue. While the star eats, the many tiny suction cups of the bat star's tube feet hold it in gravity-defying position above the sand. There are thousands of these tube feet that traverse the tank's walls every day, belonging to Sunflower sea stars, bat stars, ochre stars and leather stars. In other tanks they belong to blood stars, red and purple urchins, sea cucumbers and many more. Each one reaches out onto the glass individually; imagine having the ability to independently control multiple thousands of legs. Each tiny suction cup latches on using water pressure to create suction, and is surprisingly strong. The hundreds of suction cups used by octopus and squid operate in a similar way. Likely the most graceful creature in the aquarium, the octopus gliding along is always awe-inspiring. Another rare sight occurs when the octopus decides to eat pressed up against the glass; this does not have the same delicate appearance of the feeding bat stars. When the octopus eats her crab dinner against the glass, the crab is viewable, stuck in the middle of her body, and while the toxins she releases do kill the crab, the feeding process sometimes instigates the odd post-mortem twitch. A sight you will not see wandering through the tide pools of Big Beach, or diving in our coastal waters lies in a tank next to the octopus, and is more often than not, sadly, passed by. It belongs to the tiny green kelp clingfish. They are no longer than your finger nail, and bright green like the eel grass they live upon. In order to stick to the eel grass, the clingfish, like the sea stars, urchins, sea cucumbers and octopus, use suction. Modified pelvic fins create a sucking disk which you can see against the glass. This in itself is amazing, but the little clingfish have something else to overshadow this specialized feature. The clingfish are see-through, and when they are against the glass, you can see their hearts (which have only two chambers) beating between their gills. Perhaps you are a diver, used to the flora and fauna of the marine coast. Maybe you've visited the aquarium a dozen times already this season. Close inspection though, will bring new sights every time, and our enthusiastic staff are always there to answer questions and point out exciting displays. We are open from 10 am until 6 pm every day, and look forward to seeing you. Laura Griffith-Cochrane is the Assistant Curator at the Ucluelet Aquarium. Ucluelet Aquarium: There are things you can't see in the wild - red turban snails, green surf anemones, bat stars, crab eating octopus!